“There’s nothing but trouble and desire” repeats one individual in Simple Men (1992). Occurring at the midpoint of the film, it’s an accurate précis of Hal Hartley’s fourth feature; like his preceding films, it’s about the pursuit of romance against certain obstacles, but there’s a sense of innocence lost in Simple Men, an air of resignation and melancholy hanging in the air. The pace is tighter than his earlier work, but the dialogue feels pricklier, jagged to the point of cynicism. It was a transitional film for Hartley, ushering in the aesthetic maturity and world-weary scepticism he would later perfect in Amateur (1994). After being double-crossed by his girlfriend during a heist, Bill (Robert Burke) is determined to seduce then dump the next woman he sees. Meanwhile, his brother Dennis (Bill Sage) is on a mission to find their lost father, a revolutionary who has been in hiding for twenty years. The pair leave New York for Long Island to search for their father and, along the way, they meet a lonely bar owner (Karen Sillas) and her mysterious friend (Elina Lowensohn) as well as a host of typically eccentric locals. Four features into his career, Hartley began to really sharpen and hone his thematic concerns with Simple Men. It was the last of his Long Island films, and feels almost like an elegy to his beloved childhood home. The forlorn innocence of Long Island is played off against the cold, forbidding experience of New York. It perfectly captures the transitional nature of the picture, somewhere in the middle ground between the young director’s romantic visions of suburbia and the older filmmaker’s more sprawling, sneering version of the city. 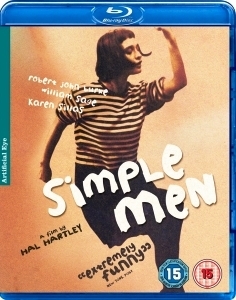 Simple Men is full of the kind of flippant philosophy one would expect from Hartley (“You don’t need an ideology to knock off a liqueur store”), but this time they begin to unravel the director’s approach to his own work. Music, an essential part of the Hartley oeuvre, is ascribed a vital importance by Bill. “You can learn a lot about love from pop music”, he says; a phrase that goes right to the heart of Hartley’s vision of romance. Ever the Godard disciple, the director includes a brilliant tribute to Bande à part’s (1964) dance sequence, with the cast performing an impromptu routine in a bar to Sonic Youth’s Kool Thing. Simple Men may meander at times, but it’s still a worthy, touching addition to the Hartley canon.